Alright. It’s been a crazy few weeks, so let’s back up a bit. A little over 2 weeks ago, we were peacefully planning for Nick’s family to come visit, for his formal winging ceremony. 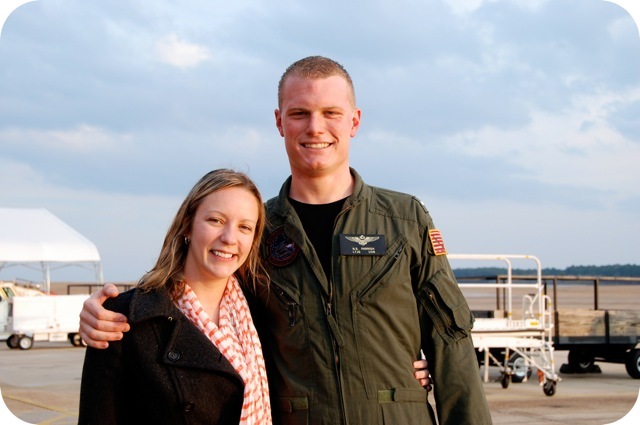 He completed his last flight of flight school and got his “soft” wings. As Navy tradition dictates, I got to spray him with a big fire hose! But it kind of backfired and I ended up getting sprayed too. Fail. At least it’s 60 degrees in January in Mississippi. A day or two later, we found out we were moving to California. It was our first choice, so we were super excited. Then the next day, we found out we had to move in FOUR days. Yes, four. It was a Thursday, Nick’s family was arriving that day and the next, and we had to be packed up and ready to go by Monday. Great. Hey, family! Welcome to Mississippi. Please help us pack. 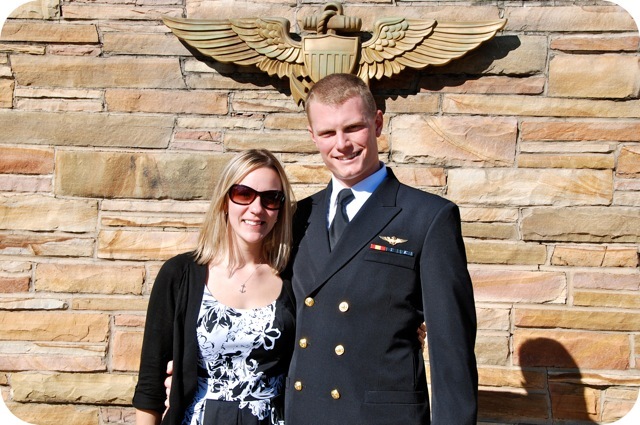 Somewhere in the middle of the craziness, Nick officially got his Navy wings. Hooray! 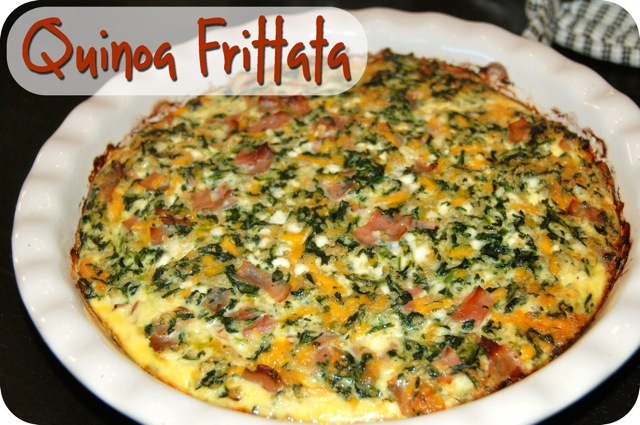 Luckily, we had this super yummy, very protein-packed frittata to power us all through the weekend. 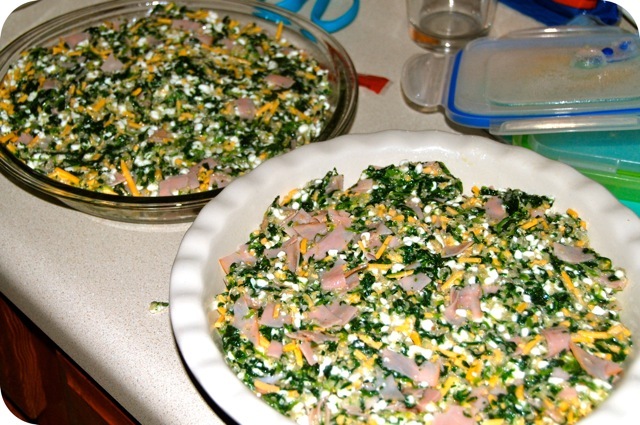 It’s full of ham and spinach and lots of cheesy goodness. The quinoa adds extra protein and some great texture. Once we’re settled in our new house, I’ll definitely be making this again! Bring the quinoa and water to a boil in a medium pot. Cover, reduce to a simmer and cook for 10 minutes. Remove from heat, fluff with a fork and cool. Preheat the oven t0 350 degrees. Spray a 9-inch pie plate with nonstick spray. Beat the eggs in a large bowl. 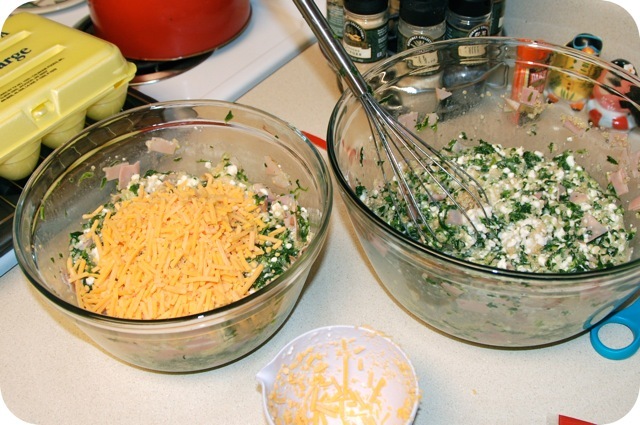 Stir in the remaining ingredients and pour the mixture into the pie plate. Bake 5o minutes, until the center is set and the edges are golden brown. Let cool 10 minutes before cutting. hi, just discovered your site & love all the recipes! 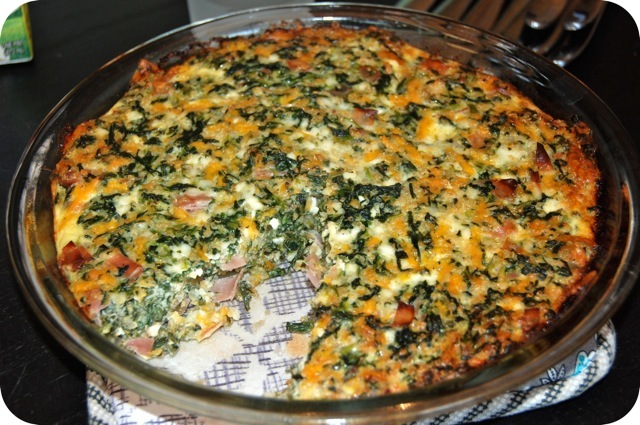 wondering how you would sub fresh spinach in this recipe without it leaving the frittata too soggy? would you recommend sauteeing and draining it? Hi Katie! You could definitely use sauteed fresh spinach. I would just lightly drain it, you shouldn’t need to squeeze it out. The quinoa soaks up a ton of moisture so it should be just fine! In your opinion, do you think it would last in the fridge and reheat well covered in the microwave for 5 days? I’m thinking of making this Sunday night to eat for breakfast throughout the week. Thank you! Yes, it does!! I always make it for the week and it’s GREAT reheated in the microwave! I really do not like cottage cheese. Is there anything else I can substitute?